For over 15 years the Lock ’n Load Tactical (LnLT) system has set a new standard in squad-level gaming. Its innovative gameplay mechanics, unparalleled artwork, historical scope and accessibility have entertained veteran and new gamers alike. Over that time, our rules have grown, too, introducing new unit capabilities and concepts; they have also matured in their presentation. The LnLT version 5.0 (v5.0) rules manual contains the latest set of guidelines and regulations for the game system. Our goal is to present the rules in a straightforward manner without disrupting their existing structure and foundation. 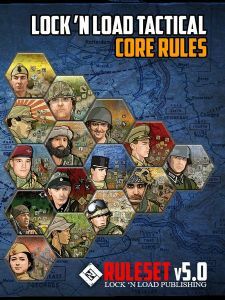 The biggest difference between the v5.0 and the v4.1 rules is that the World War II and Modern Era core rules are no longer separate, making these rules a comprehensive set, for use with the entire system. For clarity, some rules sections have been modified not with content but with a new structure, e.g., additional subsections, more bullet points, or more images and examples. Additional cross-referencing of rules and a detailed index have also been added. Other new additions to the v5.0 rules are numbered examples within sections with multiple examples and a hexagonal color-coding system has been implemented in the table of contents and throughout the manual, to make referencing certain sections and subsections easier. A new section on Scenario Information breaks down how scenarios are laid out, to aid new gamers. We’ve also included Series Resources that introduce green and veteran gamers alike to new ways to expand and enjoy the LnLT system. Learning any game system can be daunting but don’t be dissuaded; we use a large font-size, to accommodate the eyes, and have lots of examples, to illustrate the mechanics. Further, the best way to learn is to have another person show you how to play, but that’s not always an option. We encourage new players to read the two gameplay walkthroughs (for infantry and vehicles/ordnance) found at the back of the booklet before reading the rules, to familiarize yourself with how a scenario plays in an intuitive and observational manner. The v5.0 rules can be used with any previously published LnLT module.